For weeks, the Discovery Channel had been heavily hyping a special tagged, Eaten Alive, as part of their Mega D Week. In the episode, wildlife chaser, Paul Rosolie and his team were reported to have gone searching the Amazon jungle in hopes of finding a snake that was big enough to eat him. Supposedly, they found an Anaconda, and in the episode, we're supposed to see the dramatic moments where Paul is swallowed alive by the giant snake. Unfortunately, that is not what happened. I had other shows but had the show scheduled to watch today. However, I just went online and twitter reaction to the show means I'll not be doing so. Check them out! What do I and the guy on #EatenAlive have in common? Neither of us has ever been eaten alive! #EatenAlive was a pretty big disappointment. Dude didn't even come close to getting eaten. Should have called it "squeezed alive"
. @Discovery I've never watched your show Naked and Afraid but after watching #EatenAlive I assume everyone is clothed and calm. The scary part of the #EatenAlive show wasn’t the snake. It was the guy’s wife. She was down to let this all happen. Paul better watch her. 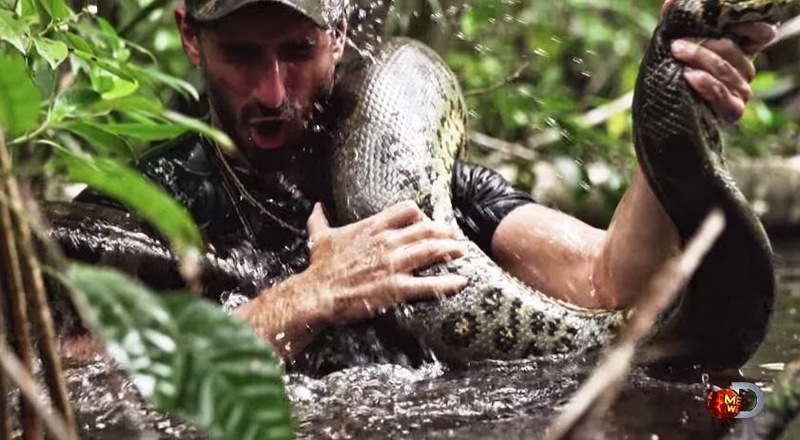 Even more disappointing is that the snake featured in the special with Paul Rosolie wasn’t even the one his team came across in the jungle, but a Peruvian green anaconda from captivity. He revealed this to People insisting both he and the snake are healthy, although he suffered a broken rib during the snake hunt. "We didn't want to stress out a snake and then release her to the wild. We wanted to be able to check her out, make sure she was okay. We kept in touch with her keeper for weeks afterwards to make sure she was alive and back to normal. We wanted to keep the suspense but really, it wasn't that big of a deal for the snake. But people have been drawing such crazy conclusions, we let them wonder." Paul Rosolie also spoke with USA TODAY before the special aired, saying he received thousands of “abusive” e-mails and several dozen death threats. “I thought it was great how many people came out in support of a snake. We didn’t hurt any snakes. Snake safety was the most important thing we were doing." While I had worried about the ethics of forcing a snake to swallow a man and then vomit him, I have to admit that is whole shenanigan just leaves a sour taste in my mouth.